As we watch Santa sail across the moon at the end of 2005 we start another new Year. 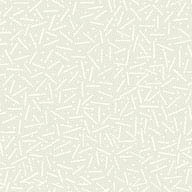 This year January was fairly uneventful but time was spent once again on web design. The Church wanted a new site and I said yes again but had help with others working on the site. You can check it out at http://www.gracelutherannc.com. By the end of January the bleak weather drove me south to St. Petersburg, Fl where Carriage Park friends reside in the winter. So, for the month of February, the Morgans, the Hardys and myself relaxed, ate well, had a few drinks and generally gabbed a lot. 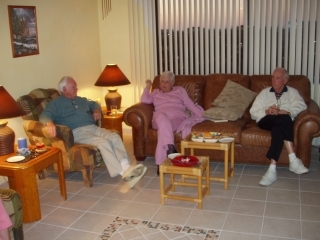 Also, while there I made my excursions to see the Grace's in their winter retreat on Long Boat Key as well as to see Geraldine Vest in Naples. 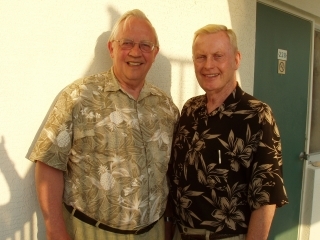 Here are two sets of "mature" retired Profs. 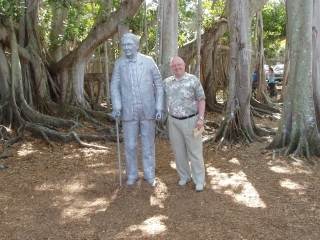 While in Florida we did get around to see a number of places including Edison's home and the laboratory. So here is "yours truly" with Edison. In March I decided to attend the annual TMS meeting and see what the old Education Committee was doing. 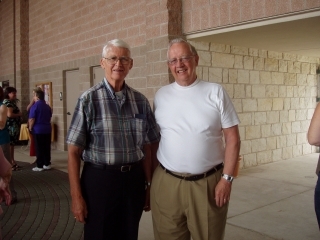 It was just the time to couple that trip to San Antonio with a stop in Austin to visit Tom Thomas. 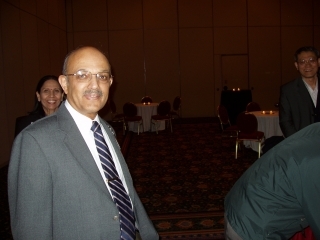 At the TMS meeting there was a special session to honor Dayananda and a "roast" given by his friends, former students, and daughter. Day survived it all. 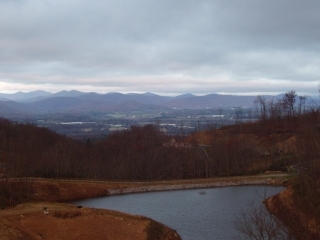 The rest of the spring was filled with a number of events and activities including, a Rotary District meeting in Roanoke, VA and a short visit by niece Lois and husband Jim. however, a major surprise came in April when Carriage Park named the new dam after me. 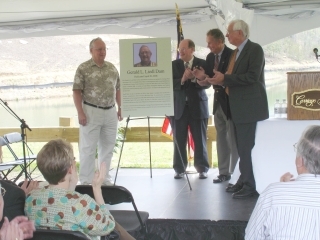 The photo is from the dedication for the dam. I really think that some people just wanted to have just cause to refer to me as "Dam Jerry"! The dedication was a fun event and they had some of the best goodies to eat after it. Now that may be why so many people came! At right is fall view of the "Liedl Dam" from my house. 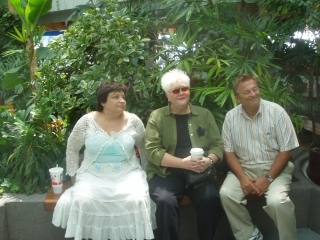 In June, Barbara and I flew north with a visit to Lois (young spiky hair one in middle) and Jim Hobarts in Chicago followed by a quick trip to Escanaba, MI to visit with the Liedl matriarch, Betty, and Chuck. 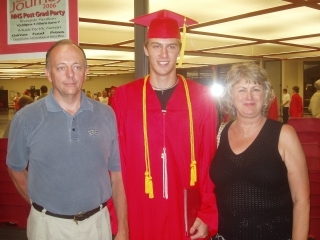 the trip ended with the major event of Max Liedl graduating from HS in Neenah, WI. Oh yes, we did visit his folks, Bob and Melissa. Max is the "short" one in the middle. The rest of June and July went by with a blur. First a quick trip to University of Alabama to give my what is now annual lecture on "the wonderful world of materials". The first week in July was spent in and around Williamsburg VA with the WHOLE family - Barbara along with Jan and her family. Eleanor and Constance enjoyed the swimming as well as our many side trips to historical sites and museums. 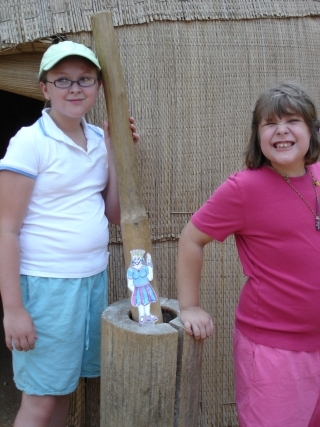 To the right are the two girls with "Flat Lois". 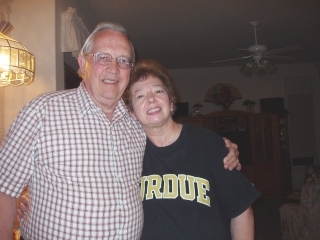 We all loved the experience and dear old Dad went the further jump to buy into a time share so we now can use that to look for each year's family vacation. In August I spent a few weeks at Barbara's place to help her recover from her knee surgery that went very well. While she had to set still in her first phase of recovery we did get her garage all arranged including setting up her tread mill with a TV to watch while working out. 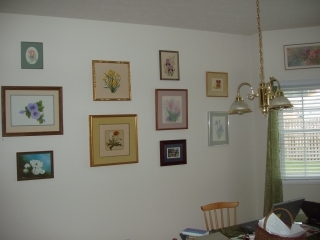 Also, we got SOME of her pictures hung. This fall has been somewhat more relaxed with a short trip to Cincinnati for the Fall TMS/ASM/CERS etc society meetings where I had a chance to visit with friends and Purdue folk. Prime reason to go is to "help" get the Career Resource Center updated - something I have been trying to get them to do since 1999! So, now we enter the holiday season and as usual Barbara was her with Loki so we could eat out on Thanksgiving and decorate the house for the holidays. We accomplished all that and now we just await Santa on his 2006 trip. 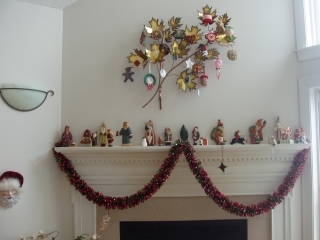 Here is the decorated mantle just awaiting the hanging of stockings and Santa's visit. May the holidays find you in good health and spirits.